The hybrid vehicle that started it all is back at it again as the 2016 Toyota Prius. The vehicle is bringing drivers a stand-out exterior design, stronger suspension, a 10 percent fuel economy improvement, and a Toyota Safety Sense system available among its new safety advancements. The 2016 Prius is promising to offer the highest non-plugin MPG and will be the first vehicle created with the automaker's New Global Architecture. Needless to say, the latest Prius is shaping up to be one of the most exciting and exquisite hybrid vehicles to ever touch its wheels to the road. Drivers have a lot to look forward to in the coming years. Running on a smaller, lighter hybrid system, the 2016 Toyota Prius is set to perform more efficiently than ever before without losing its spark. Working with a higher-energy battery and an internal combustion engine, the Prius will remain powerful while boasting a 10 percent MPG improvement making it a vehicle with best-in-class efficiency. Reimagining the Prius' exterior was a risky, but timely step for Toyota. The automaker wanted to refresh the Prius to keep it as relevant in the looks department as it is in the performance department. Earning a sleeker, more athletic shape, the Prius will become the performer it was always meant to be with details like LED headlamps and striking exterior colors enhancing its appeal. Safety has always been the top priority of any Toyota vehicle, which is why the 2016 Prius is earning new features that keep up with innovation. This vehicle will be among the first U.S. models to have Toyota Safety Sense, a package that includes a Pre-Collision System with Pedestrian Detection, Lane Departure Alert with Steering Assist, Full-Speed Dynamic Radar Cruise Control and Automatic High Beams. 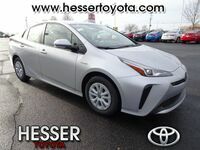 To learn more about the 2016 Toyota Prius or to learn about its release date, contact the team at Hesser Toyota today. The dealership can't wait to welcome the next-generation Toyota Prius. Interested in a 2016 Toyota Prius?